This pack contains 1 copy of Biology: Life on Earth with Physiology Global Edition + 1 printed access card to Modified MasteringBiology with eText. With a proven and effective tradition of engaging readers with real-world applications, high-interest case studies, and inquiry-based pedagogy, Biology: Life on Earth fosters a lifetime of discovery and scientific understanding. Maintaining the conversational, question-and-answer presentation style that has made the text a best-seller, the Eleventh Edition continues to incorporate true and relevant Case Studies throughout each chapter, along with new, more extensive guidance for developing critical thinking skills and scientific literacy. 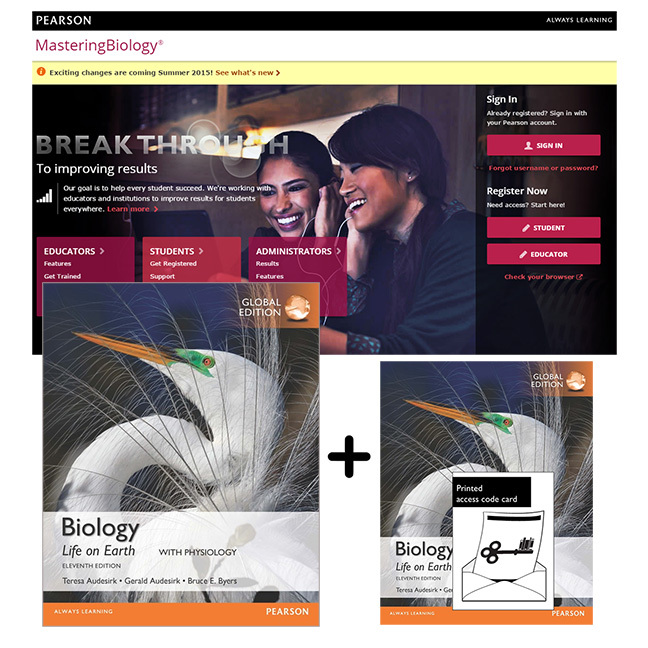 Modified MasteringBiology is an online homework, tutorial, and assessment product proven to improve results by helping students quickly master concepts. Students benefit from self-paced tutorials that feature personalized wrong-answer feedback and hints that emulate the office-hour experience and help keep students on track. With a wide range of interactive, engaging, and assignable activities, students are encouraged to actively learn and retain tough course concepts. Modified MasteringBiology is not a self-paced technology and should only be purchased when required by an instructor. The duration of access to Modified MasteringBiology is set by your instructor for your specific unit of study.